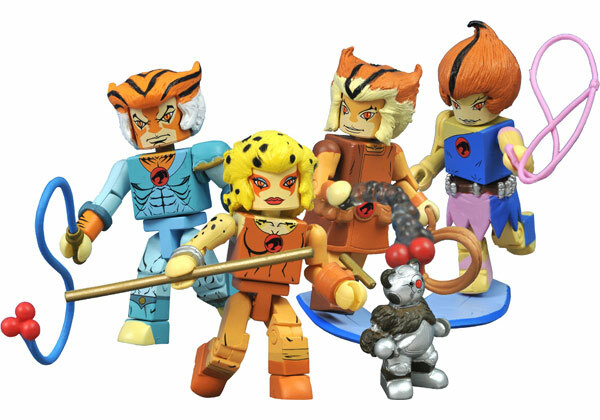 "Minimates offer followers a unique way to collect the entire Thundercat cast of characters within a moderate budget," said Rose Wang, President. "Our goal with these Minimates and the Thundercats Cat's Lair and Thundertank Environment Statues was to offer followers a way to recreate Thundera. We hope it's truly fan-tastic!" More information can be found via http://www.iconheroes.com and via Facebook http://www.facebook.com/iconheroes. Icon Heroes is a leading manufacturer of pop culture toys and collectibles. They bring popular characters to life and are excited to be recreating characters from one of our favorite 1980's animated television shows - ThunderCats! An epic, all new reimagining of the classic 1980s animated series, ThunderCats tells the story of a hero's journey to fulfill his ultimate destiny. On Third Earth, the kingdom of Thundera is being threatened by the evil sorcerer Mumm-Ra, and Lion-O, the young heir to the throne, embarks on a great quest to take his rightful place as king. The unlikely champion must work with his faithful comrades Tygra, Cheetara, Panthro, WilyKit, WilyKat, and his loyal pet, Snarf - who join him on his journey - to save their world from darkness.